For the 2009 film, see High Lane (film). 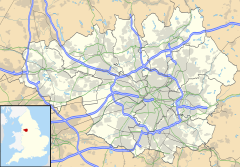 High Lane is a village in the Metropolitan Borough of Stockport, Greater Manchester, England. Historically in Cheshire, it is 5 miles (8 km) from Stockport, on the Macclesfield Canal, and has a population of 5,852. High Lane lies in the Marple South and High Lane ward of Stockport Metropolitan Borough Council. It lies in the Hazel Grove parliamentary constituency and the current Member of Parliament (from 2015) is William Wragg, a member of the Conservatives. High Lane is 5 miles (8 km) southeast of Stockport. It is bordered by the villages of Marple to the north; Hazel Grove to the west; Disley to the east; Poynton to the south. Most of the village is spread along the A6 road (which goes from London to Carlisle). High Lane lies in the foothills of the Pennines, and on clear days it affords some excellent views of the city of Manchester and surrounding towns. The population is 5,852. 95% of the population are White British. 82% of the population give their religion as Christian, and 9.8% have no religion. 64% of the population are economically active; 24% are retired. There is a Grade II listed war memorial in the centre of the village, close to the church of St Thomas (also Grade II listed). The Old Court House (dated 1772) is one of a few older houses along the main road. At the edge of the village is Wybersley Hall. High Lane War Memorial Village Hall sits within High Lane Park overlooking two junior football pitches. The village sits on the Macclesfield Canal, the Middlewood Way and the A6, a major trunk road in England connecting Luton in the south with Carlisle in the north. The nearest railway station to High Lane is Middlewood. The very long Disley Tunnel, on the Hope Valley Line, passes underneath the village. Until 1970 there was a railway station in the village, on the Macclesfield, Bollington and Marple Railway. High Lane has two primary schools: High Lane Primary School and Brookside Primary School. St Thomas' Church – Anglican. Built 1851; consecrated 1859; enlarged 1866. In modern Norman style, Grade II listed. There are three parks in High Lane, Brookside Park, Windlehurst Park and High Lane Park, which is the largest and in 2000 had a small skatepark installed. In the summer of 2010 renovations were completed and an extension to the children's play area was constructed. Windlehurst Park is known to many locals as "the little park". Wikimedia Commons has media related to High Lane. ^ Historic England. "High Lane War Memorial (Grade II) (1403193)". National Heritage List for England. Retrieved 11 January 2019. ^ a b Historic England. "Church of St Thomas and Lychgate (Grade II) (1403103)". National Heritage List for England. Retrieved 11 January 2019. ^ Historic England. "The Old Court House (Grade II) (1241861)". National Heritage List for England. Retrieved 11 January 2019. ^ "Creating the future, today". High Lane Primary School. Retrieved 11 January 2019. ^ "Welcome to Brookside Primary School". Brookside Primary School. Retrieved 11 January 2019. This page was last edited on 11 January 2019, at 09:47 (UTC).